Published in Ethics and Information Technology Vol. 10, Numbers 2-3 / September 2008, 167-173. Guest Editor: Charles Ess: Special Issue on "Luciano Floridi's Philosophy of Information and Information Ethics: Critical Reflections and the State of the Art." In my "Reply to Floridi's Reply" at the end of this paper I quote Floridi's "Reply to Capurro" in this same issue of Ethics and IT. In his paper A defense of information structural realism (Synthese 2009, Vol. 61, No. 2, pp. 219-253) Floridi argues that digital ontology deals with the view that "the ultimate nature of reality is digital". This is, indeed, as Floridi stresses, an uncritical pre-kantian view. But what Floridi calls "digital ontology" is in fact digital metaphysics. Using the term "ontology" with regard to his own theory, namely "informational ontology" ("the ultimate nature of reality is structural"), Floridi is no less metaphysical or pre-kantian and his argument is self-contradictory. When I talk about digital ontology I am taking no position with regard to the digital as "the ultimate nature of reality". I am just saying that in the present age, the digital seems to be (at least it seems to me) the prevalent perspective for understanding (!) beings in their being. This is an epistemological (in Heideggerian terms: an "ontological") view, not a metaphysical (or "ontological" in Floridi's terms) one. But, indeed, this ontological perspective can become a metaphysical one. Floridi denies the legitimacy of such a digital Pythagoreism, and I agree with him in this point. But he makes the case for a kind of informational Platonism which is no less metaphysical than the digital one he criticizes. Floridi's "infosphere" is nothing but a Platonic phantasy. 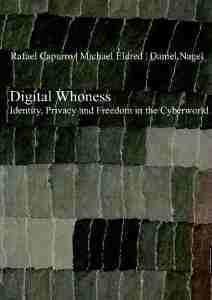 as well a Rafael Capurro, Michael Eldred and Daniel Nagel: Digital Whoness: Identity, Privacy and Freedom in the Cyberworld Frankfurt 2013. Extensive parts can be previewed here. and an abridged online version in the report of the Internet-Privacy Project. See also Michael Eldred: The Digital Cast of Being. Metaphysics, Mathematics, Cartesianism, Cybernetics, Capitalism, Communication (Frankfurt 2009). Key words Information ethics, Luciano Floridi, infosphere, foundations, artificial agents, information ecology, intercultural information ethics. Information ethics is the field that investigates the ethical issues arising from the development and application of information technologies. It provides a critical framework for considering moral issues concerning informational privacy, moral agency (e.g. whether artificial agents may be moral), new environmental issues (especially how agents should one (sic) behave in the infosphere), problems arising from the life-cycle (creation, collection, recording, distribution, processing, etc.) of information (especially ownership and copyright, digital divide). Information Ethics is therefore strictly related to the fields of computer ethics (Floridi, 1999) and the philosophy of information. Luciano Floridi and Jeff Sanders created in 2001 an institutional basis for information ethics, namely the “Information Ethics Group” (IEG) at Oxford University, in collaboration with the Oxford University Computing Laboratory and the Faculty of Philosophy. At the same time, Floridi placed information ethics within the larger horizon of the “philosophy of information” (Floridi 2004, Herold 2004), a field whose roots, at least as far as the concept of information is concerned, go back to core concepts of Western philosophy in Ancient Greece, namely idea, eidos, morphe and typos. (Capurro 1978, Capurro and Hjørland 2003). These concepts were translated into Latin with forma from which the term informatio originates. Its core meanings are: “giving form to something” and “moulding of the mind” or “communicating something to somebody.” Floridi's conception of a "plurality of ontologies" (Floridi 1999, p. 45) can be understood, I believe, within this tradition of Western metaphysics. Information ethics evolved not only out of computer science but has also roots in the library and information science field. The University of Pittsburgh and Kent State University are among the US pioneers (Froehlich 2004, Hauptman 1988). In the last ten years or so a plethora of international conferences have taken place and the number of scientific publications has dramatically increased. Specialized journals – such as the “Journal of Information Ethics,” “Ethics and Information Technology,” the “Journal of Information, Communication and Ethics in Society,” the “International Review of Information Ethics” or the “International Journal of Internet Research Ethics” – have been created, and continue to expand in number. Professional societies such as INSEIT (International Society for Ethics and Information Technology) or ICIE (International Center for Information Ethics) have contributed to the development of information ethics as a professional research field together with courses in universities world-wide. Information ethics is a key issue for the United Nations, which has organized the UNESCO conferences on social, ethical and legal aspects of the Information Society since 1998 and the World Summit on the Information Society (WSIS) in 2003 and 2005. As an academic discipline, information ethics is in search of its identity (Tavani 2002). This is due to the fact that one of its main challenges, namely the field of information technology, is in a breathtaking process not only with regard to its world-wide impact at all levels of society, but also particularly on cultures and values (Hongladarom and Ess 2007, Capurro et al. 2007). In light of the influence of Floridi's central notions on the field of Information Ethics, coupled with the growth and global scope of Information Ethics, it is especially important to critically evaluate Floridi's claims and arguments. In the following, I will first highlight some of the issues raised by Luciano Floridi on the axiological status of the objects in the “infosphere” as well as on the moral status of artificial agents. In the second part, I will present some criticisms of Floridi’s foundational arguments and claims of information ethics as an information ecology. Floridi develops a metaphysical foundation of information ethics which involves two key elements. First, instead of considering the digital interpretation of beings (i.e., as metaphysically more primary), it aims at fixing the meaning of Being within the digital perspective as today’s prevailing interpretation of Being. Although Floridi speaks about “ontology,” I agree with Terrell Bynum when he call this foundation(s) “metaphysical” (Bynum 2007). I have criticized this view in a recent paper on the basis of the Heideggerian difference between metaphysics and ontology (Capurro 2006). As I will show later on, my criticism might be less strong in view of what Floridi calls “information ecology.” Secondly, Floridi conceives information objects in the infosphere as having an “intrinsic value” and hence subject to moral respect (Floridi 1999, 2003). This is a key issue with which I dissent. Let me first present my argument as to why I disagree with Floridi's account of information objects as having an intrinsic value. Value is not a property of things, but the effect of our relationship to others. Things, natural or artificially produced, are per se worthless, no less than humans are per se invaluable. Things, either natural or artificial, have a potential economic value. Economy arises out of an evaluating process. “Diamonds are essentially worth nothing” says Mordechai Rapaport (Walt 2006). As the Australian philosopher Michael Eldred remarks, things are not intrinsically valuable, but they are good for something. Their usefulness, which is reflected and temporarily fixed as exchange value in money, arises only in the context of usages as a way of our living together or ethos in the sense of customary practice. As Eldred emphasizes, value is a “determination of reflexion” (Reflexionsbestimmung) or a “mirror relation” and not a property of things (Eldred 2004). Things are validated as valuable within the social interplay. This does not mean that the valuator would be able to assign a value ad libitum according to arbitrary preferences. When the evaluation play takes place – and it does permanently from the very moment of our presence in the world as co-players – it refers also to the players themselves, their capabilities no less than their unique role as co-players. In this case we speak of moral values, i.e., of our mutual recognition of our capabilities as well as of our special role as co-players. Both aspects of our moral lives, as validators and as members of a community, are indirectly reflected in the “interplay” (Eldred 2006) of evaluating things. The difference between both interplays, the economic (evaluation things) and the moral (evaluating ourselves) one, is that in case of the moral interplay of our mutual valuation, we can become aware of the invaluable source we bring into the play that is also the source for the determinate value we ascribe to the productive action we call labour. This, as we can call it, ethical difference between both interplays makes plausible why evaluating things and products leads to a potential, i.e., non-definite determination of the value of what we produce or encounter. The productive and evaluating action itself is part of embracing social and natural processes in which we are intertwined on the basis of our specific way of being as valuators. This being intertwined in such an evaluating process of ourselves as well as of the things we encounter and/or produce is, to put it in Kantian terms, our dignity (Würde) which is then not grounded metaphysically on our being members of a transcendent world of noumenal beings, but phenomenologically as the immanent interplay in which we are volens nolens engaged. The origin of morality as the dimension of special attention and respect we owe or pay to each other, lies thus not merely in the autonomy of the person (as Kant emphasizes), but, more radically, in the intertwining of the worthless nature of things with our own invaluable evaluating presence by letting appear the potentiality of what remains indeterminate in the process of being, or, to put it in Taois terminology, in the dao. From this perspective, economy, conceived as an interplay of evaluation, is something not only not opposed to morality but it belongs to the very essence or privilege of human existence. In contrast to this view, Floridi conceives an "information entity" – and everything that is, is an "information entity" differentiated according to the "specific essence of classes" (Floridi 1999, p. 45) – as having an intrinsic value. This is a classic view in Western metaphysics since Plato that leaves unquestioned the concept of Being (see below). The term ‘information ecology’ has been used in Germany since the Eighties (Capurro 1990). In his contribution to UNESCO’s “World Commission on the Ethics of Scientific Knowledge and Technology” (COMEST), Floridi develops a concept of information ecology as the kind of information ethics appropriate to deal with the world of data, information, knowledge and communication as a “new environment” he calls the “infosphere” (Floridi 2001). “New” is this environment since it is based on digital technology. But Floridi does not restrict prima facie the concepts of “infosphere” and information ethics to the digital. It becomes clear from his argumentation that the “infosphere” is conceived as ontologically different from the physical world. If this is the case, he is not arguing within the background of what I call digital metaphysics, i.e, the interpretation of all beings from a digital perspective. But is in another sense still metaphysics, as it clearly distinguishes between a physical or material and an immaterial world without thematising the question of Being itself. I use the term metaphysics in the Heideggerian tradition as developed by Gianni Vattimo (Zabala 2007). Metaphysics means a fixed (implicit or explicit) interpretation of the Being of beings. Ontologie, by the contrary, means making explicit the question of Being that allows to weaken theoretical and/or practical metaphysical ambitions abut what things really 'are' such as, for instance, that we are "a bundle of information" (Floridi 1999, p. 53). Are we? In some regard yes, Floridi does not advocate for a crude informational reductionism but his informational perspective is, I guess, metaphysical. When he addresses in this context the question of the digital divide (DD,) Floridi makes a “vertical gap” with regard to modernity as a project dealing with shaping and indeed mastering the physical world, while the “infosphere” is conceived as an “alternative” and “non-natural” environment or as the “atopic space of mental life” (Floridi 2001, p. 5). This is, as I already pointed out, a metaphysical or idealistic assumption. According to Floridi, the DD affects “individuals rather than societies” (Floridi 2001, p. 7). I would say, it affects societies and even whole continents rather than individuals. The World Summit on the Information Society is a clear example of the magnitude and complexity of the problem affecting the real and [not] just the "mental" life of societies and even whole continents. Floridi opposes the control of the natural world as envisaged in modernity to the construction of the “infosphere.” But I argue that this conception of the “infosphere” as a “hyperreality” separated from, as phenomenologists say, the “life world,” is a delusion. The “infosphere,” in case we still want to use this metaphor in order to address this complex phenomenon arising particularly since the use of digital technology, has become in the meantime a dimension of everyday life of millions and even billions of people, and hence it is not a particular “sphere” separated from it. It gives rise, indeed, to an environmental approach that includes, as Floridi rightly remarks, questions of energy consumption, ICT-generated waste and computer-related forms of illness beyond the specific ‘environmental’ questions of information pollution itself (Floridi 2001, p. 10). It is not at least for me fully understandable how Floridi derives from these premises his four basic norms of a universal information ethics based on the moral denial of any kind of information entropy. These norms contradict not only the unavoidable phenomenon of, say ICT-generated waste and energy consumption, but also, for instance, deleting viruses, SPAM and all kind of ‘non useful’ information. Nearly 97 billion mails are sent daily worldwide in 2007, over 40 billion of which will be SPAM (Patrizio 2007). This objection can be questioned on the ground of Floridi's distinction between "messages" and "objects" in the sense that messages that deny existence do not deserve respect (Floridi 2003) or by considering SPAM as not being (semantic) information in Floridi's sense of the term. The difference between "objects" and "messages" is all but analytically clear and plausible. SPAM does have a semantic content and is well-formed and true – at least from the point of view of the producers! In other words, Floridi’s "basic norms"(see below) are not only impracticable: further, they do not take into account that not only natural processes are based on a permanent process of creation of order or ‘information’ and entropy, but also all artificial creations. To say this another way: communication processes no less than processes of memory and oblivion are based on selection. To view the “informational ecosystem” as something perennial is a Platonic fantasy. This view of a twofold – but not a dualistic – process such as in case of the natural and the (digital) informational is something we in Western cultures can learn from Buddhism (Nishigaki 2006). Floridi and Sanders weaken the idea that any kind of data destruction is evil (Floridi and Sanders 2004, p. 21) which shows at the same time that such a deletion of data is in direct contradiction with their original claims that all information objects are intrinsically valuable and eventually a logical contradiction. looks prima facie very impressive, but under further scrutiny one canno imagine the connection of entrophy as a physical phenomenon with the "infosphere," particularly with the digital one. Eve if we conceive the "infosphere" metaphysically as the whole of reality (omnitudo realitatis it is difficult to understand how should we able to "prevent" entropy, including our own death. The key question of a flexible or situational information ethics that takes into account different natural and cultural settings and processes, no less than global informational aspects, is how to avoid blockages of this permanent changing intertwining. SPAM is an example of information overload that through its existence provokes such a blockage Information creation and information entropy are not moral opposites, as Floridi suggests (Floridi 2001, p. 5), no less than life and death, breath in and breath out or information and non-information. Take for instance the ongoing bioethical and legal discussion of the right not to know with regard to, say, one’s genetic status (Andorno 2004). Freedom of research is not an absolute moral value, as we have learned from the atrocities of human experiments in World War II. In his article “The Tragedy of the Good Will,” Floridi writes that in order to escape "the tragic condition of good will," we need more power, better information, global agents and an augmented ethics (Floridi 2006, pp. 259-260). He focuses the, as he calls it, “IT-heodicean problem” of information ethics into a question of an “ethics of creators (demiurges, as in Plato’s Timaeus)” (Floridi 2006, p. 260). He extends, following Habermas and Rorty, the moral responsibility of “individual super-heroes” to the no less heroic ethics of “super-humanity.” The main presupposition for this heroic enterprise is being to “re-ontologize the very nature of the infosphere,” particularly with regard to “new or digital ICT” (ibid.). But, hélas, humanity is not a Habermasian community and Charles Sanders Peirce’s dictum, to which Floridi refers, namely “do not block the way of inquiry” (Floridi 2006, 261) has to be relativised with regard to other values and processes that could be blocked and even destroyed by such an unconditional moral imperative of scientific inquiry, as I already mentioned. In other words, the tragedy of the good will is that it tries to escape its condition by way of power, particularly by a humanity empowered by ICT as well as by “global artificial agents” usually called computer programmes. Not only the ambiguity of such an escape remains unquestioned in Floridi’s approach, but also the question of what has been called “negative ecology” (Schönherr 1989) following the paths of “weak thinking” (“pensiero debole”) opened by Gianni Vattimo (Zabala 2007). What we need is then to ‘de-ontologize’ the “infosphere” in order to weaken the demiurgic ambitions of Western metaphysics, including the somewhat exotic idea of creating artificial agents to whom we should be morally responsible (Floridi and Sanders 2004). We have some six billion moral agents on earth. Why should we create millions (?) of artificial ones? To recall Ockham's razor, entia non sunt multiplicanda sine necessitate. As Floridi himself remarks, we need “an open and rational process of discussion about what needs to be done first” (Floridi 2006, p. 261). To think about the possibility of artificial moral agents is in my view neither a realistic nor a rational alternative at least with regard to what needs to be done and thought first. Most of the issues raised today with regard to the epistemological and moral status of digital agents do nothing but repeat the arguments of the Seventies with regard to artificial intelligence (Dreyfus 1972; McCorduck 1979). To say that “any agent that causes good or evil is morally accountable for it” (Floridi and Sanders 2004, p. 21) is simply to dilute the concept of morality. We need an intercultural debate on information ethics in order to critically discuss the limits and richness of human morality and moral thinking in different societies, epochs and philosophic traditions as well as on their impact on today’s social appropriation of information technology. This would open different paths of theory and practice that would weaken the ambitions of information technology, no less than the pretensions of moral codes and ethical thinking, and open at the same time different kind of strategies when dealing with the digital divide. This debate presupposes a patient and respectful philosophic dialogue that should not take place under a consensus compulsion of reaching universality also because universality remains, to put it in Kantian terms, a “regulative idea” that cannot be reached by any kind of moral codes. The role of ethics is to enlighten or weaken not only local moralities but also the pretension of universal principles with regard both to their unquestioned presuppositions and especially as far as they are practically misused for local interests. This is not a plea for moral relativism but an incentive to enlighten our minds and lives with regard to the open space of thought and the groundless world we share, which allow us to remain in an endless process of intertwining society, nature and technology, looking for flexible norms that regulate rather than block such a process. Western metaphysics has developed a path of thought that is based on the efficacy of power. Following François Jullien’s view of such tradition “from the outside,” i.e., from Ancient China, particularly from Daoism, we can discover alternative concepts and practices that challenge from the “Far East” the obviousness of frames of reference in the “Far West” (Jullien 1996). Such a dialogue can be paradoxically useful also by the nations in the “Far East” that have become or are becoming more and more Westernized but at the same time retrieve their own traditions – such as Confucianism in today’s China – when trying to give information society a local identity (Capurro 2006b). InIntercultural information ethics can be understood as deeply related on a theoretical and practical level to information ecology. Thanks to Charles Ess (Drury University, USA) for his criticisms. Roberto Andorno. The right not to know: an autonomy based approach. Journal of Medical Ethics 30: 435-439, 2004. Terrell Ward Bynum. Metaphysical Foundations of Information Ethics. In Kiyoshi Murata, Simon Rogerson, Terrell Ward Bynum, editors, Proceedings of the ETHICOMP 2007 “Bridging the Global Nature of Information and Communication Technology and the Local Nature of Human Beings,” Meiji University, Tokyo, Japan, 27-29 March 2007 (Proceedings in print). Rafael Capurro. Information. Ein Beitrag zur etymologischen und ideengeschichtlichen Begründung des Informationsbegriffs. Saur Verlag, Munich, 1978. Rafael Capurro. Towards an Information Ecology. In Irene Wormell, editor, Information and Quality, pp. 122-139. Taylor Graham, London, 1990. Rafael Capurro. Towards an Ontological Foundation of Information Ethics. Ethics and Information Technology, 8 (4): 175-186, 2006a. Rafael Capurro. Ethik der Informationsgesellschaft. Ein interkultureller Versuch, 2006b. Rafael Capurro and Birger Hjørland: The Concept of Information. In Blaise Cronin, editor, Annual Review of Information Science and Technology (ARIST), Vol. 37, pp. 343-411, Information Today, Medford, New Jersey, 2003. Rafael Capurro, Johannes Frühbauer and Thomas Hausmanninger, editors. Localizing the Internet. Ethical Aspects in Intercultural Perspective. ICIE series Vol. 4, Fink Verlag, Munich 2007. Hubert Dreyfus. What Computers Can’t Do: A Critique of Artificial Reason. Harper & Row, New York 1972. Michael Eldred. Heidegger’s Restricted Interpretation of the Greek Conception of the Political. 2004. Michael Eldred. The Principle of Reason and Justice. 2006. Luciano Floridi. Information Ethics: On the Theoretical Foundations of Computer Ethics. Ethics and Information Technology, 1(1), pp. 37-56, 1999. Luciano Floridi. Information Ethics: An Environmental Approach to the Digital Divide. Paper presented as invited expert to the UNESCO World Commission on the Ethics of Scientific Knowledge and Technology (COMEST), First Meeting of the Sub-Commission on the Ethics of the Information Society, UNESCO, Paris, June pp. 18-19, 2001. Luciano Floridi. On the Intrinsic Value of Information Objects and the Infosphere. Ethics and Information Technology, 4(4): 287-304, 2003. Luciano Floridi, editor, The Blackwell Guide to the Philosophy of Computing and Information. Balckwell, Malden, MA, 2004. Luciano Floridi. The Tragedy of the Good Will. Ethics and Information Technology, 8 (4): 253-262, 2006. Luciano Floridi and Jeff W. Sanders. On the Morality of Artificial Agents. Minds and Machines, 3: 349-379, 2004. Thomas J. Froehlich. A brief history of information ethics. Textos universitaris de bibliioteconomia i documentació, 3, 2004. François Jullien: A Treatise on Efficacy: Between Western and Chinese Thinking. Hawaii Press, Honolulu, 2004 (orig. French: Traité de l’efficacité, Bernard Grasset, Paris 1996). Robert Hauptman. Ethical challenges in librarianship. Oryx Press, Phoenix, AZ, 1988. Ken Herold, editor. The Philosophy of Information. Library Trends, 52 (3): pp. 373-670, 2004. Soraj Hongladarom and Charles Ess, editors. Information Technology Ethics: Cultural Perspectives. Idea Reference, Hershey, Pennsylvania, 2007. François Jullien: A treatise on Efficacy: Between Western and Chinese Thinking. Hawaii Press, Honolulu, 2004 (orig. French: Traité de l'éfficacité, Bernard Grasset, Paris 1996). P. McCorduck. Machines Who Think: A Personal Inquiry into the History and Prospects of Artificial Intelligence. Freeman, San Francisco, CA, 1979. James H. Moor. What is Computer Ethics? In Terrell Ward Bynum, editor, Computers & Ethics. pp, 266 – 275, Basil Blackwell 1985. Toru Nishigaki. The ethics in Japanese information society: Consideration on Francisco Varela’s The Embodied Mind from the perspective of fundamental informatics. Ethics and Information Technology, 8 (4), pp. 237-242, 2006. Hans-Martin Schönherr. Die Technik und die Schwäche. Ökologie nach Nietzsche, Heidegger und dem „schwachen“ Denken. Passagen Verlag, Vienna, 1989. Herman T. Tavani. The Uniqueness Debate in Computer Ethics: What Exactly Is at Issue, and Why Does It Matter? Ethics and Information Technology, (4)1: 37-54, 2002. Vivienne Walt: Diamonds aren’t forever. Fortune, December 7, 2006. Wikipedia. The Free Encyclopedia. Information Ethics. Santiago Zabala, editor. Weakening Philosophy. Essays in Honor of Gianni Vattimo. McGill-Queen’s University Press, Montreal 200. "I admit that Capurro’s article leaves me more puzzled than enlightened." Well, this is what philosophy is all about. Floridi (in the following abbreviated as F.) puts it in his "Introduction" like this: "Scientists build, whereas philosophers dig." My impression is that F.'s "Philosophy of Information" is more interested in building that in digging. "I suspect that there might be something to be learnt in his “continental” approach, and that his contribution of IE, in terms of a Heideggerian perspective, might be somehow enriching." Oh, it is really very kind of F. to say that in my perspective there "might be something to be learnt" and that it "might be somehow enriching." "But the distance between our conceptual vocabularies, philosophical methods and frames of reference has so far slowed me down. The following examples may clarify my difficulty to the reader." The distance between our vocabularies is, I guess, more a problem for F. than for me. "Capurro believes that “Value is not a property of things, […] humans are per se invaluable.” Now, as every schoolboy knows, if humans are things, and things have no value, then humans have no value. Is this what Capurro means when he calls humans invaluable?" Well, not really, since, as every schoolboy knows, humans are not things, aren't they? And if things have a value then there must be someone who evaluates them. To speak of a value without an evaluator is, as every schoolboy knows, not good reasoning. "I doubt it, but then, either Capurro is just committing a plain logical fallacy, which seems unlikely, or he must mean something different from what we normally mean by “value”, “property”, “things”, “humans” and “invaluable”. It seems to me as if F. would be commiting a plain logical fallacy addressing humans as "things." And: what does F. mean with "what we normally mean"? Who is this "we"? And what is "normal" for whom? "For example, at some points, he clearly has in mind “economic value”, but at some other points he silently shifts to “moral value”. These are very different things indeed, and the ambiguity is confusing." I do not shift "silently" from "economic value" to "moral value" but I make a very explicit distinction between things that have a value as product of an evaluator, and the evaluator that logically cannot become herself an object with a value without losing her status as a subject who evaluates. This is, by the way, closely related to the famous Kantian distinction between "value" (Wert) and "dignity" (Würde). I thought this continental terminology would be known to F. If they (humans and things) are "very different things" (!) why does F. speak in both cases of "things"? This ambiguity is, indeed, confusing. "A bit later, Capurro continues by claiming that “We humans, qua human, are evaluating beings (ens aestimans). We estimate the price of things no less than we esteem each other, learning thus to esteem ourselves.” This is fairly intelligible and quite uncontroversial, even if running together economic-price-giving activities and self- or mutual esteem processes is bewildering (this is bit like someone trying to find a connection between “banks” as institutions and “banks as shelving elevations in the bed of a river." I am sure some metaphorical sense can be made of it, but I wonder whether it might not be better to rely on some Cartesian “clear and distinct” ideas." If I state that there is a clear distinction between "things" and "humans" (a distinction that is questioned by F. or maybe not?) it is strange to read that I am equating (!) the evaluation of things and our mutual esteem. There is no "metaphorical sense" but a clear distinction between both senses of "evaluate". The invaluable esteem we "pay" to each other results from our very nature of not being just things. This is, again, Kantian legacy. It is curious to read this criticism from F. who advocates for addressing, say, digital agents, as (potential) moral agents. I wonder whether this discussion needs to rely on some clear concepts that would make it if not senseless at least (for the time being) obsolete. "However, depending on how accurate and lucid one may wish to be (and you may expect a philosopher to wish to be reasonably demanding here) then, in terms of evaluating, animals too evaluate best strategies, peers, social interactions and group hierarchies, richer sources of food, higher rewards, better partners, weaker foes and so forth. In a way, all animal life is about evaluating and being naturally selected to evaluate well. So, in the intelligible and uncontroversial sense of Capurro’s statement, there is nothing especially human about “evaluation”, unless here too Capurro means something else; but it is this “else” that escapes me." It is now F. who pays no attention to the distinction between animals and humans as evaluators. F. asks for "something else" and he oversees, at this moment of his argument, the following statement: "The difference between both interplays, the economic (evaluation things) and the moral (evaluating ourselves) one, is that in case of the moral interplay of our mutual valuation, we can become aware of the invaluable source we bring into the play that is also the source for the determinate value we ascribe to the productive action we call labour." We are, in other words, invaluable evaluators, which is again another terminology (but not just another terminology) to formulate the Kantian distinction between "Wert" and "Würde". I miss "something else" with regard to F.'s views of the difference between humans and animals as evaluators, as well as between humans and other agents. "This hardly improve in the course of the article. Suppose we manage to follow Capurro until now. I would expect anyone to agree that the fact that something is given an evaluation does not mean that it is given the right evaluation (or life would be much easier), that it should get an evaluation at all (Socrates docet: we often value what is worthless), or that it would have no value without the evaluation, for the evaluation might be just a matter of value-recognition and not value-creation (imagine nobody valuing you, would you have no value?)." I have the same impression in the course of F.'s response. Suppose we (in this case, me, at least) manage to follow F. until now, I would expect that given the relativity of any evaluation of things (!) there cannot be a "right" evaluation tout court. Otherwise we will have no fundamental problems in the stock market, no financial and economic crisis, no wars on oil etc. Yes, indeed, we often value what is worthless. But, as F. docet, there are basically no worthless things or "forms" in the "infosphere". Everything has an intrinsic value. Ens et bonum convertuntur. This is really not very new. Plato advocated for this perspective some 2.500 years ago. I can hardly follow F. then if our evaluation of things would be only value recognition, again, the stock market would be obsolete. And: how could I imagine a situation in which I am alone in the world without anybody evaluating the invaluable we reveal to each other through mutual esteem making a difference to the kind of evaluation we do with regard to things? This solipsistic argument is, in fact, a sophistic one. And, of course, the task of "evaluating the invaluable" is a paradoxical expression (F. does not like paradoxical formulations, I guess) which manifests the question of what it means to be a moral being. "Yet, Capurro ignores all these distinctions and loses me once again. Speaking of “mirroring the world as the common invaluable horizon that allows us to evaluate things” blatantly fail to help"
I am extremely sorry, but I have also the impression that F. ignores all these distinctions and loses me once again. If the Husserlian terminology of "horizon" is of no help for F., what can I say? It is maybe because at this moment I become less a transcendental (Kantian) philosopher and switch into (Husserlian) phenomenology. But, in order to understand this switch F. has to make an effort to join a "continental" tradition such as phenomenology. "It makes humans and the horizon equally “invaluable”, together with some “invaluable source we bring into the play that is also the source for the determinate value we ascribe to the productive action we call labour”, then “our own invaluable evaluating presence” and finally “human beings who function as invaluable mirrors”. The trouble is that, among all these invaluable items, I truly have no idea of what an “invaluable horizon” might be, let alone an activity such as “mirroring the world”." There is a very easy answer to the question what an "invaluable horizon" is. F. just needs to read the whole sentence: " the mutual interplay of the human interplay with the common world." The world is, I think, invaluable and we have the privilege (at least as far as we know) to be able to perceive the world and our lives "in-the-world" (Heidegger) as something whose "value" does not originate in the human evaluator alone, as different to things "in" the world. I know that this terminological distinctions might be confusing to F. since they are located in the phenomenological tradition of Kant, Husserl and Heidegger. And, as far as I can see, F. has very little knowledge or even "no idea" of this tradition. Hélas! In this case, as every schoolboy knows, it would be better to start with some basic readings before repeating again and again that he does not understand what is being addressed. "In the end, we are led to conclude that humans are invaluable mirrors of an invaluable horizon. But what does this mean? “The mutual interplay of the human interplay with the common world as an invaluable horizon” fails to enlighten the logically-minded reader, who will be baffled by the double interplay with an invaluable horizon. As anticipated, I am happy to admit my limitations." What does this mean? F. fails to grasp the simple fact that the world (no less than we as the ones who are "in-the-world") has no relative value. I am happy to read that F. admits his limitations, which he may overcome easily by reading Kant's 'Critique of Pure Reason' again, particularly the chapter on the antinomies of pure reason. But the problem is that being happy with one's limitations is related to "the logically-minded reader" which means that F. is taking for "normal" that all this argument is illogical not only for him but for the "logically-minded reader" as well. How can F. know in advance if this reader will be "baffled " or not? It could be that the reader is "baffled" by F.'s logical limitations and is astonished to read that instead of leading to the conclusion 'well, in this case, it is better to stop making comments on things I do not understand,' F. continues his adventure. Let us see what happens. "Perhaps the conversation could be improved by a few, simple clarifications. I apologise to the reader, who has been following this issue of Ethics and Information Technology up here, for the inevitable repetitions. To bore you least, I shall be brief and schematic"
It is curious to read that this philosophic discussion that has not been easy to lead could be now "improved" by "a few, simple clarifications". The critical reader might wonder why such simple clarifications have not been proposed before. F. tells the reader that he will repeat some of the arguments he used with regard to other authors of this issue of Ethics & IT. This might sound strange to the critical reader who thought that F.'s problems with this article are very specific and related to the "continental" tradition of the author. Now it seems as if some other critics are involved in the same (or similar) line as myself. "First, I do not hold a digital ontology or metaphysics. The informational ontology I defend is an ontology of structures, structures are relations and relations are not the sort of things that can be meaningfully qualified as either analogue or digital (being taller than”, for example, is an analogue/continuous or digital/discrete, the distinction simply fails to apply. So the following statement: “Floridi develops a metaphysical foundation of information ethics […] instead of considering the digital interpretation of beings (i.e. as metaphysically more primary), it aims at fixing the meaning of Being within the digital perspective as today’s prevailing interpretation of Being” is not only completely off target but also widely so." In this case I must apologise for a misunderstanding. I misinterpreted F. by considering the "infosphere" within the horizon of the digital and of what I call digital ontology or, in case it is taken for granted as the "true" essence of beings, digital metaphysics. I think that these are important matters, but that it is not F., as he himself says, who is advocating for this. In another sense I think that F.'s concept of an "ontology of structures" is in fact metaphysical as far as he considers it as the "true" interpretation (!) of Being. It is, as far as it relates to "structures" or "forms" as the highest "level of abstraction," no more and no less than Platonic metaphysics. In case it is naturalized (as it seems to be), it becomes of the Spinozean kind, as Soraj Hongladarom rightly stresses in his contribution to this issue of Ethics & IT. At this point my difficulties become serious then F. is using in this broad (or "abstract") sense of "structures" related to ethics and in fact to "information ethics". The loss of form of, say, a black hole in the universe is no less (information) "ethical" (although with different degrees!) than, say, insulting another person, or deleating an email or... of course, with different degrees of "maleficience". All this is proposed by F. as something new and is published in a journal called "Ethics & Information Technology." I really cannot see the rationality of this mega Information Ethics and I cannot see its relevance to the present focus of information ethics as dealing with the digital world. F.'s "infosphere" is more of the kind of Plato's "topos noetos" who also identifies ontology and ethics. If one tries to "dig" into the foundations of this metaphysics, I think that also an analytic philosopher (there are still some of them out there!) might learn from the debate on ontology and metaphysics that is related to names such as Heidegger, Vattimo, Derrida, Lévinas, Putnam, Taylor or Rorty, to mention just a few. "Second, the infosphere is Being considered informationally, as simple as that: “Esse est information”, where he information is not semantic but an ontological concept (imagine a structural pattern). The scientifically-minded reader may think of this ontology in terms of energy, matter and informational structures as being all interdefinable. So the citation below is badly mistaken and makes what follows it a wild goose chase: “It becomes clear from this argumentation that the ‘infosphere” is conceived as ontologically different from the physical world. If this is the case, he is not arguing within the background of what I call digital metaphysics, i.e., the interpretation of beings from a digital perspective. But is in another sense still metaphysics, as it clearly distinguishes between a physical or material and an immaterial world without making explicit the question of being itself.” Honestly, I most definitely do not conceive the ‘infosphere” as a ‘hyperreality’ separated from, as phenomenologists say, the ‘life world’”. Note that I might still be deluded about something else, yet that specific delusion is not mine". "And any metaphysics à la Heidegger will be too anthropocentric, self-referential, nihilistic and reluctant to de-centralize the human condition to be truly enlightening (to see this, the reader is invited to read Capurro's article in this collection, along with my response)." Well, it is really amazing how little F. knows about Heidegger (and other philosophers inspired by him) and how deep his bias is in this regard. If there is a philosopher in the 20th century who has criticized all his life metaphysics, then Heidegger (and many of his followers and critics). If there is a philosopher in the 20th century who decentralizes the human condition and was accused of placing Being and not the human being in the middle of his thought and who was accused again and again for not being ethical because not being anthropocentric but 'Being-centered' which is not the same thing as F.'s "ontocentrism" but exactly what Heidegger criticizes, then Heidegger. "Third, it is disappointing to see Capurro, who is a fine scholar, failing to get a message that I have been broadcasting widely and loudly since 1999 (see, for example, Hongladarom’s article in this collection, which captures it very well): entropy in IE is not meat to refer to the thermodynamic concept nor to Shannon’s equivalent measure at all. It is a metaphysical term and means Non-Being or Nothingness (the concepts are related, of course, but also have their distinct meaning and should no be confused). Metaphysical entropy is increased when Being, interpreted informationally, is annihilated or degraded. So, the four basic norms of IE discuss entropy understood as the destruction, impoverishment of vandalizing of Being. They do not “contradict not only the anavoidable phenomenon of, say, ICT-generated waste and energy consumption, but also, for instance, deleting viruses, SPAM and all kind of ‘non useful’ information” because they are not about Shannon’s entropy, despite Capurro’s subborn insistence. Frankly, who could be such a fool as to hold views that Capurro rather uncharitably atrributes me? I plead guilty to the use of terms, such as “entropy” and “information”, which have many meanings. But, in my defense, I must say that I have clarified what I mean by them on many occasions." It is also disappointing to see F., who is a fine scholar, failing to get messages that I have been broadcasting since 1978. I have seen no quotes (not to speak about discussion) of my books and articles on this issue that I have been publishing since, say, the last thirty years. To his defense I must admit that some of my major (and also some minor) works are written in German, but take, for instance, this early publication in English from 1985. F. believes that he discovered the notion of information (and its relation to 'form') and even the philosophy of information and that such discovery started mainly with his work since 1999. This is really naive. See this publication, for instance. "To conclude, I entirely agree with what Capurro writes at the beginning of his article: “shifting from computer ethics to information ethics addresses not just the question of how far computers challenge the morality of our actions, but also the question of how far we – and I think Floridi interprets this ‘we’ as addressing nor primarily computer professionals but all stakeholders – are challenged by what he calls the ‘infosphere’”. This is a good starting on which one can build further understanding. Towards the end of the article, Capurro quotes me again as saying that we need “an open and rational process of discussion about what needs to be done first” in our world. Since he agrees, we also share a common goal. All that remains to be stressed is that “rational” is not an optional qualification but plays a crucial role in how we may bridge the starting point with the goal." I am happy to read, in finem, that we agree on some key point. At the same time I must, sorry, disagree with regard to the challenge of the "infosphere". This is F.'s metaphysics or his interpretation of the meaning of Being. In my view the challenge we are dealing with is the one of digital metaphysics, i.e., of the digital interpretation of Being as the pervasive horizon in which we as scientists and as society(ies) live. The challenge of the "infosphere" is as old as Platonic philosophy. It remains a challenge, but it is not terrific new. The same can be said with regard to what "rationality" means. What we, as philosophers need, is an increased discussion on the meaning of rationality facing a digitally networked world. F. takes some kind of rationality for granted. He does not say which one and why and what are the alternatives. He just proclaims that "rational" is not an "optional qualification." To summarize: F. advocates for an "ontocentric" information ethics. My plea is for a Being-centered (not beings-centered = onto-centric) IE. This means that I pay attention to the "ontological difference" (Heidegger) between Being and beings as well as to what I think is the pervading interpretation of Being today, namely digital ontology. More on this question can be found at (Capurro 2006).